1. Preheat oven to 180 degrees Celsius. Cook noodles according to packet instructions, drain, add a dash of sesame oil and toss. 2. Grease a 12 hole mini muffin pan with peanut oil or olive oil. Press the cooked noodles into the base and sides of the muffin moulds to form the basket shapes. Brush again with peanut oil before baking for 10-15 minutes or until golden brown. 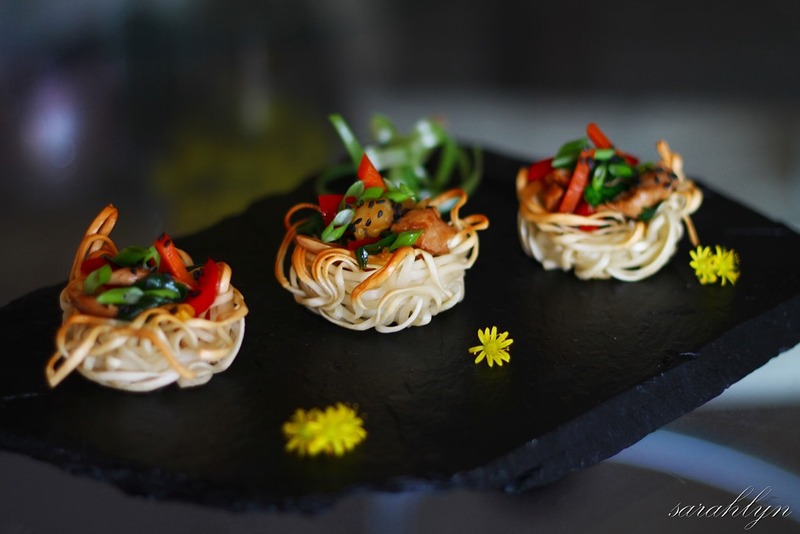 Remove noodle baskets and place on tray lined with baking paper. 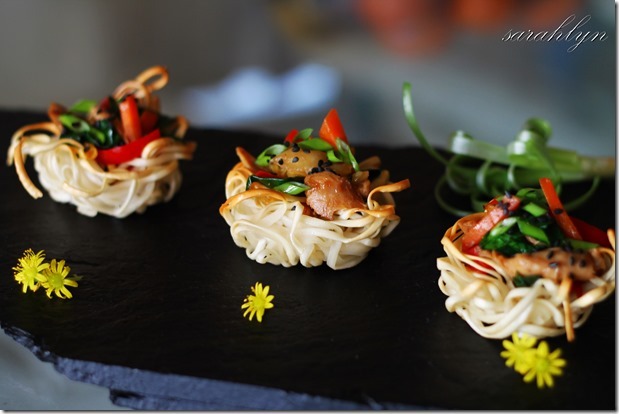 Bake noodle nests for further 5- 6 minutes or until crisp. 3. Meanwhile, heat the remaining peanut oil in a frying pan, add chicken & cook for 3-5 minutes or until just cooked through. Add garlic, carrot, capsicum, spring onion,soy sauce, Kecap Manis and sesame seeds. Toss for 3 minutes or until the vegetables are tender crisp. To serve, fill noodle baskets with the chicken mixture and drizzle with extra Kecap Manis. Garnish with spring onion. © 2014 Sarah Lewis. All Rights Reserved.